A Brown Cherry MX clone made by Kaihua in China. While K-switch quality came under fire early, later tooling claimed major improvement. I used these for years and didn't even know it. The Kailh is a little bit "sloppier" than the brown slightly less tactile in my opinion. Transparent, normal, good keys. 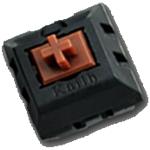 Have experience using Kailh Brown switches? Add a review to share your knowledge with the keyboard community.